Mozilla continued to hype its Firefox OS plans at Computex in Taiwan this week, revealing a deal with manufacturer Foxconn as well as the first Firefox OS tablet. Foxconn and Mozilla will collaborate on numerous devices using the HTML5-based Firefox OS, according to a press release sent out today. Foxconn's involvement won't be limited to hardware production, either. The announcement said that "Foxconn is extending past its origins…to a combination of integrated software and hardware offerings, which extends its domain to the open operating platform and positively carries out its integration plan of hardware, software, content, and services." Firefox OS is launching this month in emerging markets, and Mozilla is no doubt eager to see how its baby will be received. Partnerships with manufacturers like Foxconn are sure to help it gain ground. "Because of our shared vision, we are excited to work with Mozilla," said Foxconn Innovation Digital System Business Group General Manager Young Liu. "Firefox OS from Mozilla is based on HTML5 and open web technologies. The whole idea perfectly matches to the strategies promoted by Foxconn. We believe that the integration of software and hardware development will offer greater benefits to our customers and consumers," Liu continued. 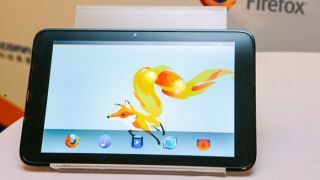 Mozilla also showed off its first Firefox OS tablet at Computex, according to Engadget. Despite the tablet's appearance, though, few details were provided. It's unclear if the tablet is part of the Foxconn partnership or something else entirely, but hopefully more will be revealed soon. We've asked Mozilla to provide more information about the mysterious Firefox OS tablet, and we'll update this story if and when we receive any. Waiting for your opportunity to switch to Firefox OS? Here's why TechRadar thinks it might be the next Android.